Please read this carefully. Providing incorrect information may delay enrolment in your subjects or result in you being required to pay your fees by the Payment Due Date. We recommend you also read the eCAF information included in Ask Us before submitting your form. You must read the appropriate Government Information Booklet before submitting your form. Please ensure that you read the instructions and choose the correct form. Submitting the wrong form could delay or otherwise effect your enrolment. 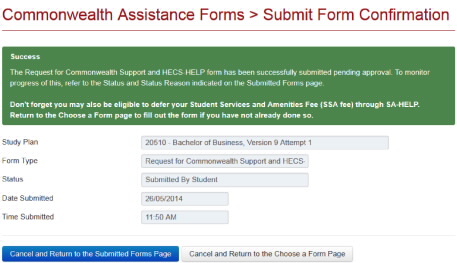 Select the Request for Commonwealth support and HECS-HELP form if you have been offered a Commonwealth supported place. This will apply to most students in undergraduate courses and some postgraduate courses. The fee liability on your Offer Schedule will indicate Commonwealth Supported. Select the Request for FEE-HELP assistance form if you are an Australian citizen, eligible New Zealand SCV holder or holder of a humanitarian permanent resident visa, liable for domestic tuition fees and wish to request FEE-HELP assistance to defer your payment. The fee liability on your Offer Schedule will indicate Dom Tuition Fees. Select the Request for SA-HELP assistance form if you are an Australian citizen, eligible New Zealand SCV holder or holder of a humanitarian permanent resident visa and wish to request SA-HELP to defer your payment. Select the OS-HELP Debt Confirmation form (if you are offered an OS-HELP loan. Students in non-award courses and International tuition fee paying students - are not able to request Commonwealth assistance, Do NOT complete an eCAF. How do I complete and submit the form? Click on Add New Form button in the row for the appropriate course. 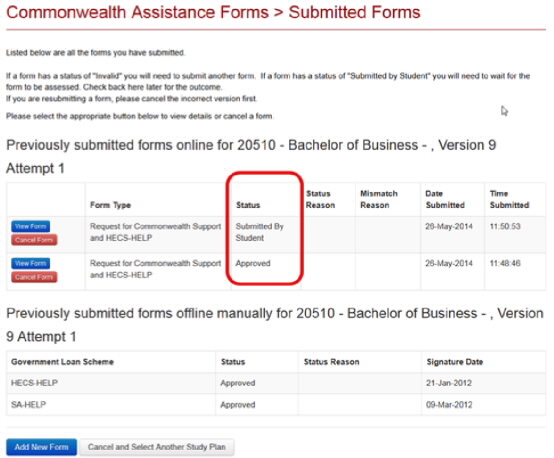 You will be taken to the Commonwealth Assistance Forms > Choose a Form window, select the appropriate form by selecting the Complete Form button. 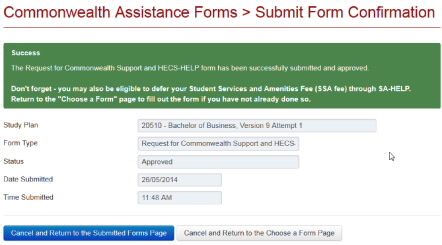 Note: The form you complete will be relevant to the selection you make, the example form shown below is a Request for Commonwealth Support and HECS-HELP form. Some fields on the form will be pre-filled, check these details are correct and enter the remaining details into the blank fields on the form. Section 5 – Student ID number: New students and those starting a new course will find their 8 digit ID number on their JCU offer schedule. Continuing students can find their eight digit ID number via StudentsOnline. Section 7C – New Zealand citizen: If you believe you meet the SCV holder and long term residency criteria you can either attach your International Movement Record to this form, or email it (before your first census date) to ecteam@jcu.edu.au. Your HELP form will remain unassessed until this document is received, this may delay enrolment in your subjects. Most New Zealand citizens and non-humanitarian permanent resident visa holders are not eligible to defer payment, DO NOT complete part 8 of this form. If you are an Australian, eligible New Zealand SCV holder or humanitarian permanent resident visa holder and wish to defer payment of your student contribution you are required to enter your Tax File Number (TFN). If you intend to pay upfront we strongly recommend you provide your TFN as a safety net. If you have not paid or provided your TFN by the census date your enrolment must be cancelled. Please read the form and check carefully that all your details are correct. Section 11 – Declaration: When you have carefully read the information provided including Section 9, and are happy that your details are correct check the I Agree box. Section 12 – Indication of payment option: If you are an Australian citizen, eligible New Zealand SCV holder or the holder of a permanent humanitarian visa, select your preferred payment option. If you selected to obtain a HELP loan, then select Yes if you wish to make a partial payment up front or No if you do not wish to make any payment up-front. You must provide your TFN for this payment option. When you have completed all the required fields, you MUST click on the Submit button to finalise the process. If you have not completed the mandatory fields or if you have entered your Date of Birth in the wrong format you will see an error message providing details of the problem. You will be required to enter details or correct errors and click on Submit again. If the message advises your form has been successfully submitted and approved, you should be able to continue with your enrolment process. If the message advises your form has been successfully submitted but is pending approval you should monitor the Submitted Forms page for a change in the status. Select the course for which you wish to view a submitted eCAF and click on View submitted Form(s) button for the required Study Plan. You will be taken to the Commonwealth Assistance Forms > Submitted Forms window, view the appropriate form by selecting View Form button. If you have just submitted the form you will need to check back later to check if it has been approved before you can enrol in subjects (HECS-HELP form only). The diagram above indicates an ‘Approved’ form. A status of ‘Invalid’ indicates there was an error on your form. You will need to select Enter a new Commonwealth Assistance Form for this Study Plan and submit a valid form to be approved. If you are not sure of your error, contact the Student Centre for assistance. A status of ‘Submitted by Student’ indicates that the form has not yet been assessed. Allow 48 hours after submission before contacting the Student Centre. If you need to re-submit the form for any reason before it has been assessed, delete the incorrect version by clicking on Cancel Form button then Continue with the Cancellation. Then select Add New button for the selected Study Plan, making sure you select the correct form and fix the error on your new form.